I think I’m going to call this season of my life, The Season of Awareness. Before I get into tonight’s post, I have to quickly mention a sponsor. It’s hard to believe that it’s almost time to start thinking about Christmas shopping. But, if you’re anything like me, I like to use Amazon to get everything delivered right to my door. I have a special 30 day FREE trial offer for Amazon Prime – which gives you free 2-day shipping on anything you order. So give it a try for 30 days – get your Christmas shopping done and shipped for free, and help BBB out in the process 🙂 Thank you! I had a really incredible experience this past weekend when I was home in Ohio. It was one of those beautiful fall afternoons in the scenic Ohio River Valley where the leaves are so vibrant that the trees look like they’re on fire. And my mom invited me outside to sit at the pool bar and just have a little mother daughter time. Ever since my mom’s stroke, she has become so perceptive at reading people. It’s like she has a sixth sense or something. But anyway, she could tell that I had a heavy heart, and just invited me to unplug and go enjoy the crisp fall afternoon outside. And while we were out there, she invited me to pray. Now, I’m going to be honest, I haven’t really prayed in front of someone in a long time, and I was pretty self conscious…even though it was my mom. I just felt…really vulnerable. Almost…phony. And maybe that is a glaring red flag that my prayer life needs work, but whatever, I digress. And I’m tellin’ ya…it was one of the most moving experiences of my life. My mom has always had a special connection with the Lord, but ever since her stroke, it’s like she literally has God’s ear. All the time. It’s like she has a direct connection with Heaven. But she started praying, and I kid you not, at that moment, the wind started picking up, and I felt this beautiful breeze on my cheeks. It was honestly as those God Himself was giving me a little kiss on the cheek. And while she was praying, the wind chimes started gently playing a little melody in the breeze. And that smell of fall just filled my nostrils. I was having a total sensory experience. And all I could think about in that moment was the closeness of God. How, He is all around us. And how, I need to be more aware of His presence. I can be so wrapped up in worries or technology or fears or the little stresses of the day, that I literally can miss the nudges of love from God – be it in the form of wind chimes, a gentle breeze, the smile of a child, a song lyric, etc. We had a beautiful prayer time that afternoon. My mom is so in tune with her loved ones, always praying for exactly what they need. We both ended that afternoon in tears of gratitude and love. Coming back to New York City yesterday, I was really trying to hold onto that awareness of God’s closeness. I’m only here for 48 hours, and then I have to go back to Ohio for a photoshoot. But yesterday evening, I decided to take a little walk. And that night, I was blessed with literally the most beautiful sunset I have ever seen in my life. And I have seen some pretty incredible ones in my lifetime: Wisconsin, Iceland, Utah. But this one took the cake. And I stood there watching the sky absolutely ablaze in all different shades of coral and pink, and I just smiled, knowing that God was again revealing His love for me in that moment. For the last couple years now, I’ve been on the quest for love, and one of the things my mom prayed for that afternoon was for me to allow someone to love me. And perhaps this is the first step. Recognizing all the ways in which God loves me. Learning to see and be aware of all the little love notes He leaves. Because as soon as I can believe that I am worthy of His love, the sooner I can believe that I am worthy of a man’s love. Like I said, The Season of Awareness. What are some of the ways that you recognize God’s love for you? Next Post Let’s Hear it for Halloween! Beautiful post! It reminded of my grandmother’s keener wisdom and discernment after her stroke. God’s move is very obvious in your life. I have no doubt He will order your steps as He continues to do for me and my family. This month has been full of tragedy and transition, but God keeps making a way when there seems to be no way. “How, He is all around us.” I’ve always thought of His omnipresence as like the sky. There is not one place on Earth where there is no sky and God is just like that. “Be still and know that I am God…” Psalm 46:10. As I read your blog that verse came t mind. There are, of course, many translations for that verse and Biblehub.com (http://biblehub.com/psalms/46-10.htm) had them all to scroll through. One translation read, “Cease striving and know that I am God…” One of the things I think we forget to do in our face pace, hyber-busy, overstimulated world is to STOP and BE QUIET. God is always speaking to us, but that “still, soft voice” gets lost in the hustle and bustle. The moment you sat with your mom you stopped and were quiet – to hear and be heard. The walk and sunset are a result of knowing you need time to STOP and BE QUIET. It is hard to do these days. I find myself challenged in this too. Thanks for the reminder that I need to “Be still…” more often. I have become keenly aware of God’s love for me in the last several years. It actually has opened my heart to see people differently and to be able to, or, be more open to loving others and showing some mercy. I guess knowing that He loves me right where I am made me see that his love is pretty wide and deep. But not just for me, for everyone. Even the ones I don’t like so much. But now I’m open to giving others some slack when they are not so easy to be around or get along with. Sorry, that was a little long. It’s always a little difficult for me to describe the effects God’s love has on me. I think love is his superpower. Beautiful blog! My dad is very ill and it was nice to read this and gain perspective! Thanks a bunch! A bro in Tucson! I was running in the in Florida. I took a wrong turn and ended at an alligator nest there were two or three and some babies. I closed my eyes and prayed. I talked to the girl. I complimented her babies and told her I was a dumb tourist. If she let me go, I’d never come back. They all tramped off. It was amazing. I felt like God gave me a hand. There. God. Is good. I’ve been half frozen. Dehydrated. Other. Military stuff. I just pray and really try to listen. I’m not sure why it’s listening. The hum of things. Acceptance, is hard and scary. You are, so special. Worthy of God and whatever lucky fella stops by to stay forever. A bubble in a can of soda. Seems insignificant on its own but the total amount of bubbles is 10^18. That’s 18 zeros. I worked for Coke last week. Similar amount of air was in the last breath of Jesus. That air fills our lungs today. Your mom is great. I’m sure, it’s hard to think that you may get there with God. I’d sit with monks and they would shrug. Ha. Well, it would translate to a shrug. Breathing. It’s what keeps us going and brings us closer to God. wow that’s such a crazy statistic! thanks for sharing that. You’re welcome. I think, I understand the NFL thing better. I wrote a post about it if you want to check it out. That’s awesome! If I ever sponsor, God willing, I would follow the same guidelines you do 🙂 I found a recipe for manicotti in the crockpot, so it’s in the crockpot, I’m catching up on today’s posts reading, and then may work on my book 🙂 Overall, it’s been a good day! Corollary: And the sooner you will have confidence that a man truly loves you because you can tell whether his presence brings God closer to you. Beautiful. Thanks for sharing your experience with us. Your mother sounds so very special. May God answer all of her prayers. Amen!! Just wonderful. What a great Mom you have too. What a beautiful sunset picture! Nature is the best place to pray and commune with God. When and where was mankind closest to God? Completely in nature in Eden. After that and sin is when we moved into tents, caves, and eventually cities. Away from where God originally intended us to live. I like the way God brings a verse from the Bible to my mind just when I need it. Also, if I am especially sad or anxious, I talk with God about it and he gives me peace of mind. I feel loved at those times. Great post, dear, and beautiful picture. You should do more photography! For most of my young adult life I felt like I was looking for love in all the wrong places. Truly. I got to a place where I felt truly empty. It was then that God entered my life in a powerful way, and I gave my life to Him. He has brought me through some pretty incredible circumstances, but recently, He brought me 1000 miles from where I was and put me in a place of restoration and healing. I was in some pretty difficult situations where I was and He brought me out of that. There’s a line in the Bible where it says He set me in a large place, and that’s what He did for me. Last thing I want to say is earlier this year, He said, Call unto me and I will answer and do great and migthy things (Jer. 33:3) , and He is increasing my faith incredibly. God bless you dear. I pray that God will increase your faith and set you in a large place. I have recently become more aware of God’s immediate presence. For most of my life (and I’m 59 now), I have always thought of him “out there” or “up there” somewhere, looking down on me. He could see me, and communicate with me in various ways, but was always distant. Recently, I have become aware that he is right here with me. He is in the atmosphere, in the air that I breathe. This has had a radical impact on everything in my life in the past few weeks. Most especially my prayer life. If you have time, and are up for a pretty hefty read, I highly recommend The Divine Conspiracy, by Dallas Willard. It’s deep (he was a philosophy professor) and dense, but it’s my new favorite book. Great post! I think Autumn is a great season for Awareness. It is my favorite time of year, with cool sunny days and the changing colors. Although where I live we don’t get a lot of areas with color changes. Even driving and hour and a half north last Saturday with a friend, there was hardly any colors other than green. Your post is a great reminder for all of us to open our hearts and minds to hear God’s whispers and feel His love. Maybe you’ve found your still, small voice. How marvelous, how wonderful, is my Savior’s love for me! It’s funny how you have written about learning from a parent when I have written today about learning from children. Learning is truly all around us. Great writing as ever. Beautifully written! 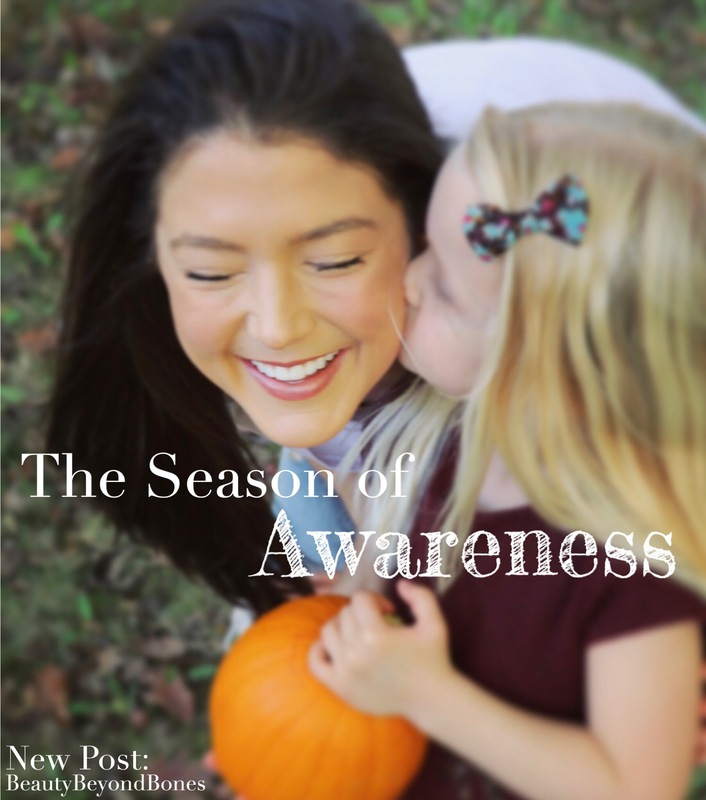 I love the idea of a Season of Awareness. Your posts are always so thought provoking and often seem to speak to just what I need to hear. Thank you. Thank you for this.. I am just trying to recognise the season in which I am in now.. And your words guided my soul on what I should look for and also that I should stop looking elsewhere and just be; and be in the presence of the Lord.. I thank you and to your wonderful Mom. Am becoming a real fan. Thought hey, today’s Thursday that great girl who writes well and loves Christ Jesus is posting again. I wish to God , ahh, nevermind. My only comment about being “worthy”of a man’s love is this. You young lady are so far off the chart triple threat perfect inside and outside your like a Lamborghini Aventador in a lot full Kias. Finding a man you want and he wants you should be pretty darn snappy. You are in deed beauty beyond bones. I been praying for God to bless you big time. And he will. Having the Armour of God leaves nothing to attack. You wear yours well. Continue your Journey. Hi, It’s been a week since I tarted to visit your blog and I can definitely say this: Your Blog is Amazing! I’m becoming one of your fans <3….. Thank you as well beautybeyondbones, your blogs are motivating and inspiring. I loved it, so much. love lots. Prayer with loud voice and in front of others release you powerfully and allow you to know who you are. You are hearing your voice repeating encouraging words that makes your mind and would fill with God’s heart word. Oh I remember first time prayed in group such a melting away for me. but when I backed now _ I see wow what a day. It is great to pray with others.. so Good. do it with your friends. have you recently checked my blog ? Did you know that a new book will be relegated in December ? have you read my short ebook about “7 things for your soul” . Wow! Bautiful post!..My imagination played along as I read the whole article. Such a wonderful mother-daughter scenario. Made me miss my mom. God bless you both! Unplugging can be so hard for me, but … “be still and know…” is SO true. 🙂 Finding God in a sunset or the breeze is so often exactly what I need. Well said! A harmony in a piece of music that hits all the right notes. The color of the autumn leaves on my walks through the forest preserve. The smile of my wife across the dinner table. A chuckle from one of my sons. A passage of Scripture that just explodes so unexpectedly off the page during a devotion. I was there, in that very same place, when I was in my early 20’s. Looking back at that time now from my early 50’s I lament all that I missed in life, my life and the life of my beloved friends, because I was questing for love. If I could go back and talk to my early 20’s self I would tell him, “Relax! Love will find you. You don’t have to go looking for it! That’s the way love works. After all, God sought you out – remember? ‘While we were still sinners, Christ died for us’! Enjoy life, enjoy the moment.” That’s what I would tell myself. Keep up the good work and writing! You are God’s inspiration to so many of us! Beautiful Caralyn, just beautiful! As a recovering codependent I too am still learning how to let somebody love me and to let God love me. For most of my life I lived it believing I was not worthy of love but now that I am getting older I am learning new things about myself, life, and God. Thank you for this fresh reminder to let love in! And same to you! Have a great weekend! 😉 thats what I’m talkin about. Beautiful post. You can move mountains! Holy Spirit, show Caralyn who she is. She is loved by her Father, He thinks that she’s beautiful. He loves her so much! Love you sister! You’re amazing! You have so much to offer the world, Caralyn, and He wants you to know that you have not been put on a shelf somewhere and forgotten. Yes you’ve had your hang ups and a horrible past, but He’s taking the ashes and making something beautiful. You’ve already helped so many and you’re going to help so many more. Thank you again. I am truly so moved by your kindness. This is one of the most profound questions I have ever come across. I have always felt there are two places where there are no accidents – politics and God – of course, it begs us to focus on one over the other. And with that in mind, your post is the perfect thing for me to read as I met with my priest a couple of hours ago and I took issue with him telling me to look for blessings in my life. That’s really what it’s about isn’t it? We can’t really see, hear, feel, or experience love if we are unable to see how God offers Himself to us, right? …and I think I need to focus on my prayer life, as well. Thank you, for the reminder. If you happen to read my most recent post, could you please tell me if it made sense? It is such a hard thing for me to write about I may have rambled. Thank you!! I’ve removed that post but thank you anyway. How did your photo shoot go? How blessed you are that your mom has such a connection with God. I don’t think we ‘deserve’ God’s love and grace, but it’s not about merit. This world is about merit and that’s why we cannot conceive of something so radically different. I hope God fills you with more and more each say with confidence in his eternal love for you! I needed to read this! I’m feeling a little down & this was EVERYTHING! Absolutely beautiful post! God was definitely flirting with you! So glad you and your Mom had a great time together. Especially the prayer time. I know you will always cherish that. Thanks for sharing. Blessings! Good thoughts as always, bringing God and men into proper perspective. Each day that I wake up to a brand new day, I know that God loves me, and even when I have my sad or down days. It’s like some kind of warmth comes over me, and it may not be from my room’s heater. Everyday that I step outside and see the surrounding trees, streets, and views around my home, I smile because without Him, all of it would not be here today if it wasn’t for Him taking care of it all, including us. God is so amazing! 🙂 Glad to hear that you were able to pray and spend time with your mother. Beautiful sunset! I’m glad to hear you had a great time in Ohio. I went on an eight day silent retreat last year. I wanted to deal with my own issues with anorexia and bulemia and to try to silence the destructive voice of ED who doesn’t want to let me go. God gave me something I needed even more at the end of that week. If I had to describe what I received on a t shirt, it would read – I am a child of God; treat me accordingly. I believe God wants you to receive the same message. Wow! Such a beautiful post. I’m so glad you were able to experience God. Sometimes with the business of life, we forget God and prayer but he just wants to talk to us and draw closer. I’m a few days late on this. Busy. But as for how I recognize God’s love, I don’t have a good answer, except that this has come up recently as something I need to work on. And part of that is because I feel like I haven’t had the complete experience of human love… of course, that pales in comparison to God’s love, but in many ways, I feel like I don’t know what it’s like to be loved in the first place… does that make sense? I’m just rambling now. I need a nap. Thank you for your touching story of your time with your Mom. I feel God’s love through my relationship with my wife, friends, our dog Abby. I feel the presence of God in the colorful leaves of the fall, the sparkling snow of winter. I am sending you much light and love as you move through the transitions you are experiencing. God is always there and will help you as soon as you honestly need and want His help. When I reached a very low point in my life long ago, I asked God to remove my emotional and physical pain. By way of firm reply He told me that He never asked me to walk alone, but it was I who had previously told Him that I did not need Him. The more you lean on God, the more His presence is evident in your life. God Bless, R. I.
I recognize God’s love in all the many ways He calls me by name. Sometimes in whispers and still others in a strong booming voice. I am so grateful when I am open enough to hear Him and seek forgiveness for the times when I am so caught up in the world, in self, in others that I fail to recognize He is calling out to me. I am glad you heard Him recently and that you were able to share such a beautiful moment with your mother in prayer, as well as the wonder of His creativity in the sunset. Stay open…and I look forward to hearing just how magnificently He will reveal your “true Love” to you. Hugs & Blessings! Wonderful to read and watch God move in both you and your mom’s life. You are so blessed to have a mother who prays with you; there are so many who are spiritual orphans like that, including yours truly. But God sends other spiritual parents our way in any case. WHAT a sunset!!!! I had a brilliant silver sunrise like that recently. There are definitely times that we are privy to such beauty and it is no coincidence, it is personal – just for us – and warming. But we need to be awake – and aware – of when it happens. Praying for you on the journey; your joy is contagious. I love this! Moms are so special. Relish and God bless. Beautiful post. I love the Season of Awareness and feel as though I’m in the same. God loves me, loves you. While it’s easy to say it, the true test is in believing it in your soul. Hi dear, me too I adore kittens and puppies!! your words and kindness are making me speechless. It is an honor to be your friend. You deserve all the best and good from this world ☺️ much love and hugs on your way!! Such a beautiful blog post! It’s definitely important to be aware of God’s love for us. I’m finding your blog so inspiring, thank you for sharing your journey and your thoughts! I hope your mum’s doing great, take care! Strong post about possibilities! Isn’t it a bit ironic that the sunset/ the ending of a day can give us hope about new beginnings? Superb, as usual. Often times it is the simplest of things that move us the most… if we take the time to notice them! M. A.